Fay will not go away. Sure, we needed rain but enough already. Tropical Storm Fay had our full attention this week. Monday was devoted to hurricane preparation—nursery plants were laid on their side, anything loose was tied down or brought inside, hanging pots were put on the ground. Fay left trees leaning or toppled, black bamboo whipped to the point the canes broke and, of course, lakes where none had been. The aftermath was caught in photos taken by Kurt Van de Wouw, nursery foreman, and Rich Lewis, operations manager. We had fish swimming among the floating anthurium collection in the butterfly house. That's volunteer Win Turner standing in the butterfly house at the edge of the water; Rich Lewis, operations manager, is knee-high in water in the gecko section. The lake on the way to the Preserve climbed its banks to meet the path. The nursery site just abandoned by Palmetto Road became a lake --- got out just in time! 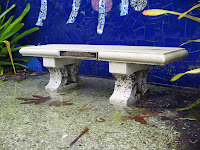 The water at its high point in the Tropical Mosaic Garden reached about 12 inches as the water line on the concrete bench in the photo shows. The Garden had some work to do to prepare for Wednesday, August 27th's Tropical Mosaic Garden visiting day. Besides the righting of trees and huge cleanup, the Windstar Garden Room is being "refreshed." If you haven't visited for a while check out the next dates for these pre-registered visits on our About Us page of the website. When you come, from the visitor parking lot, you can get a peek preview of some of the construction. Bayshore Drive offers another vantage point. Volunteer Ann Raker surprised us with a tetrio sphinx moth (Pseudosphinx tetrio). She lives in old Naples and found tetrio caterpillars defoliating her frangipani tree (Plumeria spp.). This caterpillar has to be on steroids as it’s the size of a small snake. Hi. I'm looking for Kurt Van De Wouw. Does anyone know how I might be able to contact him? I'm a friend from Kwaj.